chaletisola – Beautiful ski chalet in the southern French Alps. Our lovely semi-detached, self catering chalet is located in Isola 2000 in the Alpes du Sud. It is on the Chalets du Mercantour development overlooking the Chastillon valley. The chalet sleeps up to 6 people. There is one double bedroom with balcony, a twin bedroom, one bathroom upstairs, one bunk bedroom with en suite shower room downstairs, and an open plan kitchen / living / dining area. There is a woodburning stove in the living area, underfloor heating on the ground floor and free broadband internet access. There is also a large terrace from which to enjoy the spectacular views, and a secure garage located in the main chalet building. Our semi-detached, self catering chalet is located on the top row of the Chalets du Mercantour development, it has been awarded four stars by the Alpes Maritimes tourist board. The chalet is only accessible on foot and there are several steep staircases up to the chalet; please be aware of this before booking the chalet. 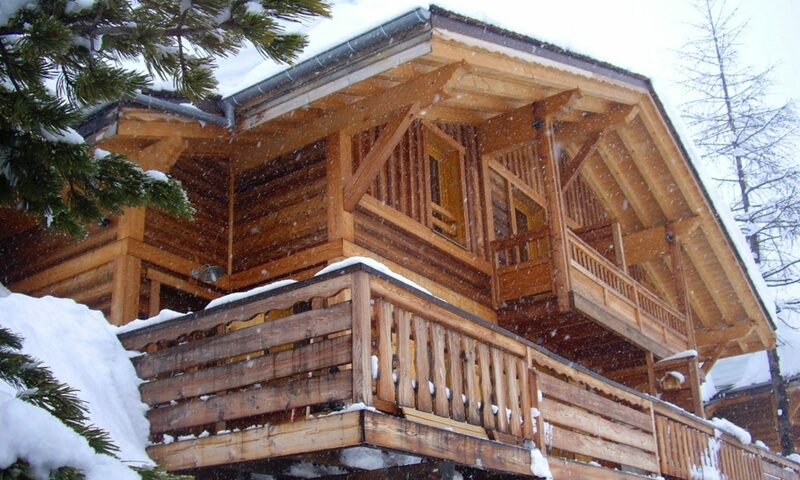 The chalet has three bedrooms, one bathroom, one shower room, an open plan kitchen, dining area and living area. The floors on the ground level have underfloor heating which makes the chalet even cosier. There is also a wood burning stove. The chalet has a large terrace with outdoor furniture including deckchairs, upstairs there is a balcony off the master bedroom. We have furnished and equipped the chalet as if it were our family home, there are plenty of kitchen utensils, there’s a 32″ flat screen TV with Chromecast and a DVD player with small selection of DVDs; board games, maps and books about the local area. The decoration is Alpine style and many of the photographs and objects relate to the surrounding area. Take a look at the floor plans or find more about the bedrooms, bathrooms, living/dining areas and the outside space. Isola 2000 is located just 90 minutes from Nice airport in the Alpes Maritimes, and only 10 minutes from the French – Italian border at the Col de la Lombarde. The resort was built in the 1970s and much of the original architecture remains; the main building houses the ‘Galerie Marchande’ where you can find almost all the shops and services conveniently located under one roof. Situated above the original resort buildings is the Hameau with a mix of chalets and apartment buildings and a link down to the main resort via the Funicular. The resort is located in the lovely Chastillon valley, with the impressive Tete Merciere at the head of the valley. It is a 30 minute drive to the nearest village of Isola, and a little further to the neighbouring ski resort of Auron. As for skiing and snowboarding, there’s plenty for all the family whatever level you are. For the beginners there’s the Front de Neige which hosts the magic carpet lift for the little ones and a beginner Poma lift. Intermediate skiers and snowboarders will find plenty of gentle blues and greens with lovely views. Whilst the intermediate / advanced skiers can take advantage of the red and black runs along with the Snow Park. Our favourite runs include taking the chairlift to the top of Sistron and on a clear day of catching a glimpse of the Mediterranean sea. Its also great to take the Lombarde chairlift up to the Col de la Lombarde where you can ski along the French-Italian border and look into Italy towards the Santuario Sant’Anna – a monastery nestled high up in the valley. We’ve put together a bit of information about things you might like to know before you visit Isola 2000. We have details of some of our favourite restaurants, essential shops, where to get ski passes and most importantly how to get to Isola 2000. If you have any questions about the chalet, please fill out the form below and we’ll do our best to answer them.